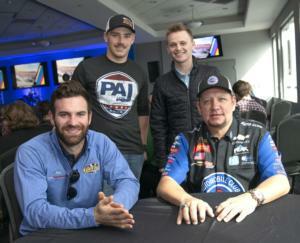 With less than a month to go before cars hit the track in East Tennessee, drivers from the stock car and drag racing worlds arrived at Bristol Motor Speedway & Dragway on Wednesday, March 13th, to preview the upcoming season. Monster Energy NASCAR Cup Series driver Corey LaJoie, NASCAR Xfinity Series rookie Justin Haley, NASCAR Gander Outdoors Truck Series champion Brett Moffitt and NHRA Mello Yello Drag Racing Series star Robert Hight were on hand to meet with media, chat with regional business leaders, industry sponsors, Bristol ticket holders and more. The quartet also spent time on the main stage for Q&A sessions with Sirius XM and Performance Racing Network host Brad Gillie. The cities of Bristol, Kingsport and Johnson City were well represented at the 2019 Season Preview as business leaders got an in-depth look at what's to come in 2019. Following the event, a few lucky winners were able to take the ride of a lifetime during a session of track laps with LaJoie, Haley and Hight. LaJoie may be a relative newcomer to the NASCAR Cup Series, but he's no stranger to the high banks of BMS. The driver of the No. 32 machine for Go Fas Racing made his Bristol debut at age 14, driving a Pro Challenge Series event. The experience prepared him well for the intensity that is The World's Fastest Half-Mile. "After a race here, your neck and lower back are sore and your pride is sore after getting smoked by Kyle Busch," said LaJoie, referencing the winningest driver in Bristol Motor Speedway history. "I love just driving to Bristol because when you come down the road and turn a corner you are like 'holy cow, there she is.'" Haley is embarking on his first season in the NASCAR Xfinity Series, having joined Kaulig Racing before the start of the season. The rookie is no stranger to Victory Lane, having won three races last season in the NASCAR Gander Outdoors Truck Series. Haley will arrive at the Alsco 300 on April 6th for his first official NXS start at Bristol. The driver of the No. 11 Chevy Camaro could be eligible to win an additional $100,000; the Alsco 300 serves as the first race for the Xfinity Dash 4 Cash program. The defending NASCAR Trucks Series champion, Moffitt, enters 2019 with a boat load of confidence. The driver of the No. 24 Chevy Silverado for GMS Racing is extra motivated for Bristol for a new reason: the UNOH 200 presented by Ohio Logistics serves as the opener to the 2019 Truck Series playoffs. A win in the first playoff race would go a long way to help Moffitt in his attempt to repeat. A two-time Funny Car champion on the NHRA tour, Hight is no stranger to success at Bristol Dragway. The John Force Racing Chevy Camaro SS driver won the NHRA Thunder Valley Nationals in 2011 and is always a threat. The Father's Day weekend date for the drag race holds a special significance for Hight: his daughter, Autumn, is a rising star on the NHRA Junior Drag Racing scene. A win at Thunder Valley would provide a special father-daughter moment. After winning the season opening race in Pomona, Hight very much looks like a threat at Bristol this season. "I just love the atmosphere and the setting here at Bristol Dragway," said Hight, the current NHRA Funny Car points leader after winning the season-opening Winternationals in California and posting two No. 1 qualifying efforts. "I've loved coming to Bristol ever since we raced here in the '90s with the Winston Showdown. John Force won that race and I was a crew member on that team and it was at the time the sport's biggest payout and a very special win for us." Tickets are available for the many exciting events at Bristol Motor Speedway & Dragway. Tickets for the Food City 500 (Sun, April 7) start at only $50, with tickets to the Bass Pro Shops NRA Night Race (Sat, Aug. 17) starting at just $60. Add on tickets for the Alsco 300/Zombie Auto 150 (Sat, April 6), Bush's Beans Pole Day (Fri, April 5), Food City 300/Pinty's Qualifying (Fri, Aug. 16) and UNOH 200 presented by Ohio Logistics/Bush's Beans 150 (Thurs, Aug. 15) and you have two full weekends of NASCAR racing at its best. Want to bring the whole family? Kids 12-and-under are only $10 to NASCAR Cup Series races and free to NASCAR Xfinity Series and NASCAR Gander Outdoors Truck Series events. This year, BMS also announced the addition of teen pricing. Teens ages 13-19 are half off with the purchase of an adult ticket. Tickets to the NHRA Thunder Valley Nationals start at only $30, with kids 12-and-under free. Guests will want to check out Friday night qualifying and one of the most popular fan fests on the circuit on Saturday following nitro qualifying. Everyone is invited to celebrate Father's Day on Sunday with Doughnuts for Dad and the official Track Walk. As a reminder, every ticket is a pit pass, allowing guests up-close and personal access to see their favorite drivers and teams work on these 10,000 horsepower machines.